L’Obs magazine a well know publication from Paris France, were in contact to commission a map for their upcoming September edition. 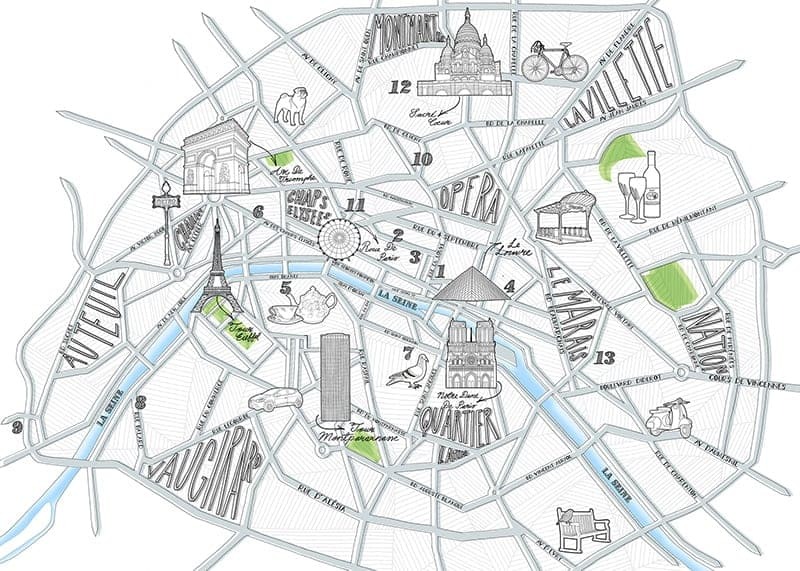 The brief was to create a map of Paris with a mixture of names of streets, famous buildings, and the name of neighborhoods for L’Obs magazine. The Paris map was illustrated to scale because it was important to place 10 locations (the famous power sites) on the map for readers to be able to navigate the map and be practical, as well as retain its illustrative look and feel, which was an important feature of the map. I initially sketched the whole of Paris, with important and key road drawn into the map. On this occasion I choose to draw the map at a large scale, larger then I have drawn a map before, at A2 size, this allowed me to draw in a lot more detail in terms of the loads and streets. I then drew the 10 keys sites of Paris which, included the Eiffel Tower, Champs-Elysées, Louvre Notre Dame, Cathedral Sacré-Coeur, Arc de Triomphe. As well as key Paris neighborhoods. The map feathered a numbered key, which was relevant to the text. These numbered keys were the locations of institutions and well know Paris powerhouses which were important and relevant to the written text of the article.